Before I left the house Monday morning, I prayed the Lord would send me the biggest baddest sinner he could my way. 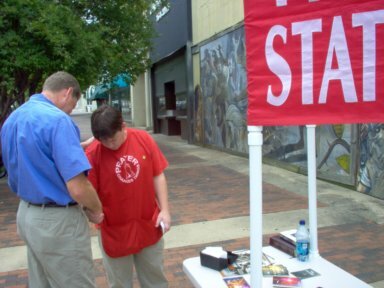 While I did not have any that seemed to fit that description, we did have three atheists from Chicago, two whom were pretty big prove their foolishness while out with the Prayer Station this past Monday. My brother Reggie began the conversation with them as I was talking with someone else. When I was done, I stood about and listened to Reggie as he spoke with the trio. Reggie was able to share the Ten Commandments with them to show them their sin and while one of them laughed and walked away, surprisingly, one of them admitted that he was guilty of breaking God’s commandments and would go to hell if he died, the third one Dan, said no and that God did not exist and he would not be guilty or go to hell. As I heard the conversation progress, I jumped in and Dan and I began to talk. There wasn’t much arguing with him, but Reggie continued and shared the law and gospel, but he remained in his folly. Dan did make a few points that I have heard asked. “Why did not God just keep Adam and Eve from sinning? Great question I thought. In a class on Calvinism recently at church we discussed this. Indeed while many things do leave us with questions and we may wonder why? We trust in God and in His perfect will. But to think that if there were no sin, if God had indeed kept Satan out of the garden and indeed He could have and He could have prevented the fall, none of us would ever have known what grace is. Indeed we would never have seen grace in view of the cross of Christ. We could have spent all eternity in heaven and be satisfied, but indeed, with all of God’s attributes, grace is indeed one we cherish and no one deserves. I shared with Dan, some of what I learned in the class and again no reply to it, just another question. Not since the late Dr. Greg Bahnsen debated Dr. Gordon Stein in “The Great Debate: Does God Exist?” have we really seen presuppositional apologetics in action. And few have taken it into culture to show that there are only two positions, Christ…or absurdity. The Lord gave the opportunity to speak and pray with quite a few this morning at the Prayer Station alongside my brother Tom Hicks Jr. in whom I grateful to know and witness with. The thoughts of the incidents in Oklahoma were mentioned by many I spoke with. Even looking at the devastation and hearing of the loss of all that people owned and even the loss of life, God remains God! He remains sovereign and abundantly good! His word brings comfort and assurance when we see an experience such acts of nature, “Fire and hail, snow and clouds; Stormy wind, fulfilling His word” Psalm 148:8. We can recall the great flood and know that it was a work of His hand and while a great unsearchable number, men, women, & kids, perished in that flood, He spared eight. Not for anything that had done, but because He good and merciful, and because He alone is God. A great many more could have perished in Oklahoma, but many survived, again, not simply by the shelter that they sought, but by His mighty hand. How much more has He delivered us from what we do deserve, by pouring our well deserved wages because of sin upon His Son. Psalm 148 gives a rightful response to Him and His glory which is to simply praise the Lord. 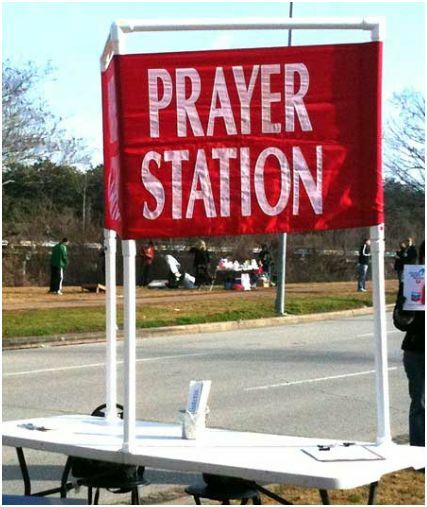 As much as desire, I just can’t seem to make it out with the Prayer Station as regular as I once was able to. But each time I take it out, I am very blessed and humbled at the opportunity to go before the Lord on the behalf of those that request prayer. I can’t express to you enough how humbling it is for me of all people to be able to pray with complete strangers, hear their burdens and needs and the cries in their heart. To be able to offer comfort in knowing God’s word is true and that He reminds us that in all things, “Rejoice always, pray without ceasing, give thanks in all circumstances; for this is the will of God in Christ Jesus for you. 1 Thessalonians 5: 16-18. Although, I have been somewhat restricted due to time and other matters, I was able to take the Prayer Station out this past Wednesday. I was joined for a short while by Rafael, my good and faithful brother in Christ that I have mentioned in previous post before, as well as Catherine, my darling four year old daughter that loves to go witnessing with me. The day gave many opportunities to pray and share the glories of God with others. To not just comfort one but to share the importance of repentance and faith in Christ. Below are a few names and a short summary of the request asked of us. I ask that you would pray for these individuals and their specific need. As you pray though, pray that God would as well draw them to Him. That he would open their eyes and show Himself to them; that they may indeed see their need for a savior and repent and place their faith in Christ as Lord and Savior. Sarah ~ She stopped her car in the middle of the road in desparate need of prayer for her husband Edward and her son Edward Jr. The details were not mentioned. Just pray for them. Annie ~ Families Salvation, Son Orlando In Jail. As always, I am thankful for your prayers as well, pray for laborers. All to often we look at the situations and infirmities of life with a negative standpoint. We see them as weights or thorns in our flesh that cause pain rather than triumph. We moan and groan through the storms of life instead of seeing the calm after the storm and the glory of creation afterward. Those times of great trials are often followed by times of great prayer. Our burdens lead us to our knees to petition our God for deliverance. When we think He has not heard us, the clouds tend to break and the sun shines through and we come out of it much stronger than when the storm began. 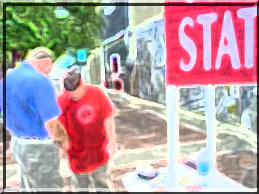 On Tuesday, I placed the Prayer Station on a quiet street corner between Dexter and Perry Street in Downtown Montgomery. I had been praying for the people I knew I would meet days before and it had been as if I could already see their faces. Some filled with joy over life while some feeling the weight of it. My heart was humbled and broken by the time I left. Humbled that such a wonderful and holy God would allow such a depraved sinful being into His throne room and bring Him petitions on behalf of those I prayed with. Broken over those that I saw that were without hope and in despair. I thought often of God and His heart toward a creation in need. For these few shorts hours, I had the opportunity to talk to people, pass out tracts and share the gospel with numerous people. I heard people express concern over unsaved family members, abusive husbands, loneliness and so forth. Thankfully, I was not alone the entire time. I was encouraged and thankful for a good brother who joined me on this corner, Rafael Ray. He had been on his break from work and just happened to be walking by. Below is a list of those we had the chance to pray with. Please when you pray, remember these individuals and the needs they expressed. Of all the needs that were prayed for, the greatest need of each person that we tried to stress with them was the need for a Savior. That man is lost and separated from God because of sin. That as depraved individuals with nothing good in us. Even our Good works are filthy rags to a holy God. Isaiah 64:6 That in man’s rebellion toward Him, God showed mercy and provided a way for man to be reconciled with Him. That as we rejected God and broke His laws, God sent His Son, Jesus Christ as a substitute on our behalf. Christ gave His life on the cross and was resurrected three days later, paying the fine for the crimes we committed. We broke the law, Christ paid the fine. God’s word tell us that If we turn from sin and trust in Christ, we shall have eternal life. This is mans greatest need. Harriett ~ Husband Ludie D. has cancer and is in hospital. 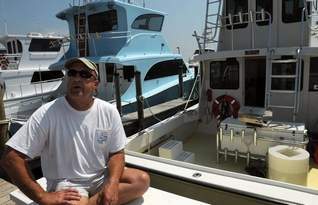 I read this evening of the death of “”Rookie” Kruse, a fisherman all of his life and charter boat captain in Orange Beach, Al. Like many that live and depend on the Gulf of Mexico to help maintain their way of life, things have come to a halt due to the massive oil spill that is plaguing the Gulf. In the charter boat business for over 26 years, I’m sure Rookie has seen his fair share of up’s and downs like many of us. This past Wednesday however, Captain Rookie was found dead of an apparent self-inflicted gunshot wound on one of his boats. I can’t help but to try to comprehend what he may have been dealing with. Life can be tough and can bring the worst at times. I myself have seen my share of hard times as have many of my friends. I am deeply sad for Rookie and I encourage you to pray for his family and all of those that are affected by the oil spill in the Gulf of Mexico. Or the words of the Psalmist, “God is our refuge and strength, an ever-present help in time of trouble. Though the earth give way and the mountains fall into the sea, though it waters roar and foam and the mountains quake with their surging ~ Psalm 46:1-3. It is very easy to become dependent on that job you’ve held for numerous years and that paycheck that ends up in your bank account on each Friday. But if you were to wake up one day and find that that job had suddenly come to a halt and that weekly check along with, would you give up or cling to the words mentioned? Man’s greatest need however is that of salvation. No matter how wealthy and prosperous or poor and needy one is, we are all lost and in need of a savior. 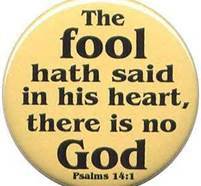 All of us have sinned and fallen short of God’s glory. As you pray, and hold fast to your faith, pray that through the troublesome times, that God would use this as an opportunity to glorify His name and bring people to repentance and faith in Christ. Free water was a good draw-card to get people to stop by the Prayer Station this afternoon with temperatures reaching a high 97° degrees this afternoon. But man can’t live on bread alone or in this case, ice water; so along with the water, some tracts and bibles were available as people walked by our station. Some walked on their way to lunch,work or to pay bills nearby at the power company. Some looking for employment like Arthur that recently relocated from Tennessee that was looking for work in the hotel business or a group of joggers that haven’t learned that it isn’t wise to jog in 97° degree weather. The Prayer Station offered many opportunities to pray and witness to people this afternoon. Many walked by just looking trying to figure it out, asking questions and taking a few tracts and water, even if they did not have a prayer request. Even as I was breaking down the station, an opportunity to witness came my way. I was walking across the street to load my gear in my truck, when a car stalled in the road and I assisted a couple into pushing their vehicle to a parking spot, handing him a tract as I made my way back to my gear. Later on as I continued to load up, the man that I assisted walked pass the station and I offered him some water. He politely took some and questioned me about my station. I briefly told him what it is and how we use it. His name was Gregory and come to find out, he was a believer in Christ as well. We spoke a bit about evangelism and church and I asked him if he had something I could pray with him about. No short list here. His car just died on him, his house is in foreclosure, his wife lost her job and he is being sued. I shared a testimony with him and assured him that God knows his situation and that every situation is an opportunity for God to glorify Himself. That he formed us in the womb and knows each day of our lives ~ Psalm 139. With a few more words of comfort, I prayed with him and we both were able to sharpen each other through words of encouragement. These are just a few examples of people I encountered on this hot afternoon in Montgomery. While those that I spoke with and prayed for had many needs and needs that are important to God and to myself, man’s greatest need is that of salvation. With everyone we speak with, we not only pray for their needs but question them if that need will be of importance to them 300 years from now. Most likely not. The only thing that will matter to any of us 300 years from now is where we will be spending eternity. So to those we ask, where will you spend eternity? Mrs. Calloway ~ Finances & her appliances in her house have died. Rodney P. ~ Son of Mrs. Calloway, in jail for a crime in which his mother says he did not commit. Bike Policeman ~ Catholic guy I witnessed to, pray for more opportunities to witness to him. Marcus ~ Struggling with the lust of the flesh and being consistent in his time with God. Matt, Shannon, & Stewart ~ Prayer request given by another lady for her children. Gregory ~ Finances, employment, situations with being sued and car troubles. Laura ~ Her business she just started and family. While these request are specific, pray too that God would not only answer the prayers requested but that He would indeed draw each and everyone of these people to Him, saving them. As I have mentioned before, this Prayer Station is a great tool to use to share Christ. If you would like to use it for your own outreach or church event, I freely offer it to you. Just contact me about the details. Everyone has a need that needs to be met, whether a health issue, financial, or an issue with relationships. While these needs aren’t any less important to the individual or Christ, a persons most important need is that of salvation. Many of the individuals that we have the opportunity to pray for have pretty much the same needs as I just mentioned. With the Prayer Station, we have the opportunity to talk to people and pray with them for what ever that may request, but with the intention of stressing to them their most important need of where will they go when they die. 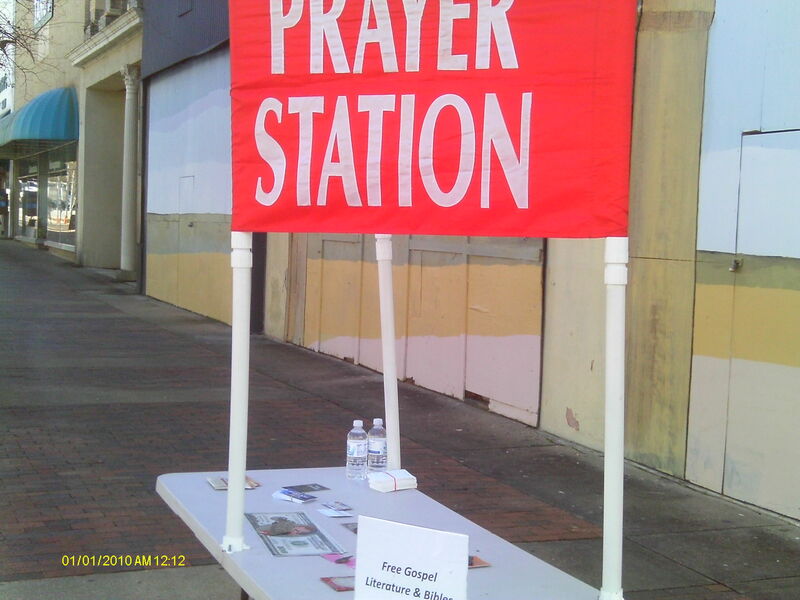 It has been over a year since I had taken the Prayer Station out on the streets of Montgomery. I had forgotten what a great tool it is to use when reaching the lost. Two those wondering about this, what we do is set a table up and place tracts and bibles and give some free water and as people pass by, ask them if they have something we could pray with them about. As I mentioned, with the intent to share the Law & the Gospel with them. Today I was joined by my friend Jamie and later in the day by my 6 & 3 year old that passed out tracts to those walking by. We were able to give away many of our bibles and tracts and pray and share Christ with others. Below is a short list and summary of those we met and the need that they requested we pray for. Please consider these individuals when you pray, that God would not only fill the need but draw them to Himself. Harvey ~ Issues with bills and had a stroke that has disabled the right side of his body making it difficult to use his arms and walk. Calvin & Tewana ~ Boyfriend & Girlfriend, when asked if we could pray for them, they just request a general prayer, nothing specific. However upon speaking to Calvin, he was depending on his good works to outweigh his bad in hopes of going to heaven. His girlfriend had little to say but Calvin asked what must he do to get to heaven and seemed sincere. Rosalie ~ Had requested healing with a pain in her body that she has suffered for many years. Said she was a Christian and has has issues with coworkers and wishes to be a light at work. Pray for boldness to reach the lost. Craig Smith~ Rosalie’s son that was injured in Iraq, losing part of his leg. he lives in D.C. and she says he is backsliden. Ms. Patterson ~ Requested prayer on getting her son back and the relationship with her daughter to be strengthened. Consuela ~ Requested financial help and relationship. She is a recovering drug addict, recently became straight. Prayer for all that we met and passed out tracts to that we did not get the chance to pray with. As I mentioned, pray for these individuals and most importantly that God would not only meet their needs as He wills, but will draw them to repentance and faith In Christ. If you would like to go out with us one afternoon and help with the Prayer Station, please do not hesitate to contact me. If you would like to use it for you own personal use or small group/church use, please let me know as well.